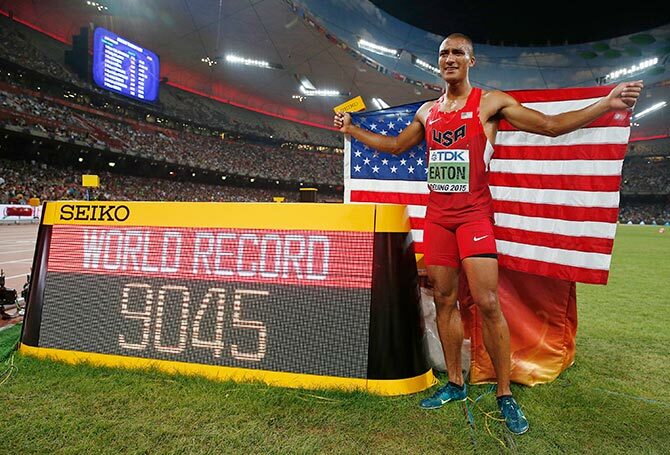 American Ashton Eaton retained the decathlon world title on Saturday and broke his own world record with a score of 9,045 points. Eaton's previous world record was 9,039, set at the U.S. Olympic Trials in Oregon in 2012. The silver medal went to Canada's Damian Warner, with a national record total of 8,695 and German Rico Freimuth took bronze on 8,561. There had been little doubt through the second day's events that Eaton would win gold and it was all about whether he could better his world record. The Olympic gold medallist from Oregon had set up his charge towards the record in the 400 metres, the fifth event of his 10 disciplines on Friday, when he ran 45.00sec, the fastest ever by a decathlete during a multi-event. Eaton finished the first day on 4,703 points, well ahead of medal challengers Warner Freimuth and the second German, Kai Kazmirek. Eaton's procession towards the gold continued on Saturday with a 13.69 second 110m hurdles, a 43.34 metre discus throw, 5.20 metres in the pole vault and a 63.63 metre javelin throw. The 27-year-old needed to run 4:18.25 or faster in 1,500m to score the 824 points needed to break the record. After two gruelling days and the nine previous events, Eaton set off with a carefully-paced run and after a hard-fought final lap he stopped the clock at 4:17.52, to add 829 points to his tally. Eaton is married to the Canadian heptathlete Brianne Thiesen-Eaton, who won the world silver medal this week.